Hong Kong Airlines, an internationally-acclaimed full-service airline again won recognition in talent management. Following the Employer of Choice Award 2015 presented by JobMarket magazine early this year, the Company received “The Best Place to Work in Hong Kong Awards” 2016 from HRM Asia magazine yesterday. 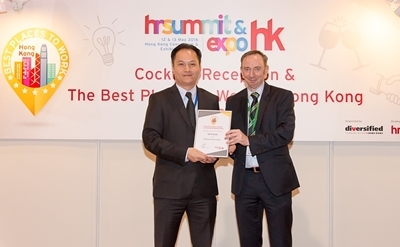 “The Best Place to Work in Hong Kong Awards” is organized by HRM Asia, the leading HR Magazine and the organizer of the long-running and industry mainstay, HR Summit – Asia’s biggest HR show. The prestigious award honors outstanding enterprise’s dedication to the well-being of their employees. This year, 10 renowned local companies were nominated as finalists in the category of Transportation, Logistics and Public Utilities, and Hong Kong Airlines was the winner of “The Best Place to Work in Hong Kong” in this category. “To further strengthen Hong Kong’s edge as a major regional aviation hub, we will continuously strengthen talent management to make Hong Kong Airlines the best place to work, and nurture more talents to facilitate the development of the local aviation industry. The establishment of Hong Kong Airlines Aviation Training Centre (HKAATC) will be a key milestone as it provides ideal and employee-friendly workplace with advanced facilities.” Mr. Yau added. The HKAATC is targeted for completion in 2018, offering a variety of aviation services and related training facilities. The fleet and destination network of Hong Kong Airlines continue to grow as the airline expects more than 10 new routes including long-haul ones in 2016, and bigger fleet size of over 50 by 2018. In the future, Hong Kong Airlines will step up its efforts to develop into an international airline.